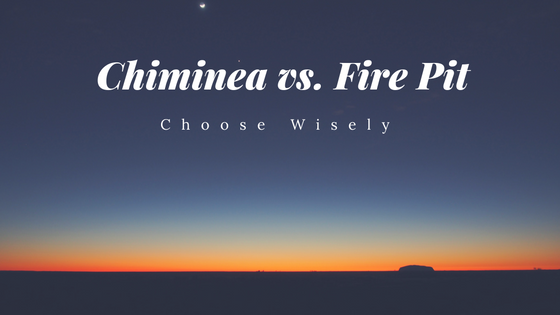 Chiminea vs. Fire Pit - Which One Should You Buy? Chiminea vs. Fire Pit – Which One Should You Buy? Why should you buy a chiminea instead of a fire pit? The chiminea has been a focal point for gatherings in gardens and on patios for centuries. From their modest beginnings as tools in the 17th century to their current attraction as a centerpiece for outdoor decoration and design, these objects have proven their worth time and again. However, fire pits have also drawn in many outdoor enthusiasts, leaving the question as to which choice is really better for you. Which one will be the safest and allow you to spend the most time enjoying your company? When it comes to safety, a chiminea is always a better choice than a traditional fire pit. Flames are directed up and out of the well-designed stack of the chiminea, giving a much more controlled burn than a fire pit can offer. This allows you and your guests to sit back and enjoy your evening, rather than worry about shooting sparks and flames that may go out of control. Constant tending is needed unless you create a large fire, which poses safety hazards. Guests will need to change seating whenever the wind changes direction due to the smoke. Sparks can fly around, creating a burn hazard for guests and surrounding vegetation. Not suitable for patios, porches, or inside your home. These problems are easily solved by choosing a chiminea rather than a fire pit. Once you have a small fire burning in a chiminea, you can sit back and enjoy the evening. Unlike fire pits, which require either a large fire or constant tending, a chiminea can burn for hours with just one or two small logs in the fire bowl. This is due to the design of the chiminea itself, which was originally created for the purpose of baking bread. Such a long-burning design is hard to beat when you want to enjoy a night with your friends and family, but do not want to spend much time tending the fire. As mentioned above, the bowl and stack of the chiminea are designed to create a natural draft. Air enters the front of the bowl and is drawn up into the stack and out the top. This natural draft will keep your fire burning without you having to worry about fussing over the fire. With less time spent tending your fire, you can direct that time towards family and friends, truly enjoying your evening. Fire pits, no matter their design, simply have fewer options when it comes to where you can place them. With flames able to lick up and out and sparks able to float around freely, you must be very careful to place them well away from anything flammable. Chimineas can be placed in a large variety of areas, including indoors if you choose a gas-burning style. A simple installation of terracotta tiles on your patio or porch will provide a fire-safe base for the chiminea to be placed on and keeping the chiminea a few feet out from any objects or walls will help to ensure that the heat does not pose a fire hazard as well. Unlike fire pits, installation of a simple spark arrestor on the top of the chiminea stack will keep sparks from causing problems without blocking the fire itself. This makes tending a chiminea far more simple while covering safety as well, creating a much more preferred option for most fireplace enthusiasts. Each material also offers a range of design options, giving you a chance to truly create a useful piece of art for your home, garden, patio, or porch. Whether you choose to use the chiminea as it was created, to burn wood, or choose to simply use it as a conversation piece in your interior design, the many design options make a chiminea a far more viable choice than a fire pit. In addition to offering a great selection of materials and designs, chimineas also offer a few options for burning types. While the most common type is outdoor wood-burning, you can also purchase a gas-burning chiminea that can be installed inside your home just like a regular fireplace. This allows you to enjoy the beautiful traditional design indoors and can even be used as an alternative heat source for your den or living room. This versatility allows a chiminea to serve the purpose of saving you money over the long run where heating costs are concerned, something a fire pit simply cannot provide. The gas-burning types are becoming more common every year as buyers look towards alternative heating options for their homes. This has made the chiminea a sensible choice for many owners who have chosen cast-aluminum or cast-iron styles for their home and use them to burn pellets or natural gas during the colder months of the year. Overall, when it comes to choosing between a chiminea and a fire pit, the decision is yours. However, when you consider the versatile and beautiful design of chimineas as compared to the very basic and limited use of a fire pit, the best option is very easy to see. 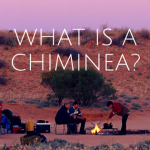 You may have never heard the word chiminea before, but I can bet that you’ve seen one. You may not know them by that name, but they are quite common in the world today. More importantly, do you know what a chiminea does? We’ve done the hard work to bring together facts and details to provide our readers with the most complete chiminea resource available anywhere. Read on and enjoy! Cooking with a chiminea is not difficult and there are a variety of different foods that you can create with these lovely outdoor fireplaces. Whether you want to use the chiminea to grill some delicious chicken, or get a bit creative and perhaps create an amazing casserole, you can do it with a minimum of fuss and great results! 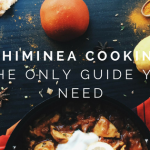 We’ve taken the time to put together a few cooking ideas, as well as some tips for cooking with your chiminea effectively.